The ugli or ugli fruit is a Jamaican form of tangelo, a citrus fruit created by hybridizing a grapefruit (or pomelo), an orange and a tangerine. UGLI is a registered trademark of Cabel Hall Citrus Limited, under which it markets the fruit. Its species is Citrus reticulata × Citrus paradisi. It was discovered growing wild (possibly having developed in the same way grapefruit was created) in Jamaica, where it is mainly grown today. 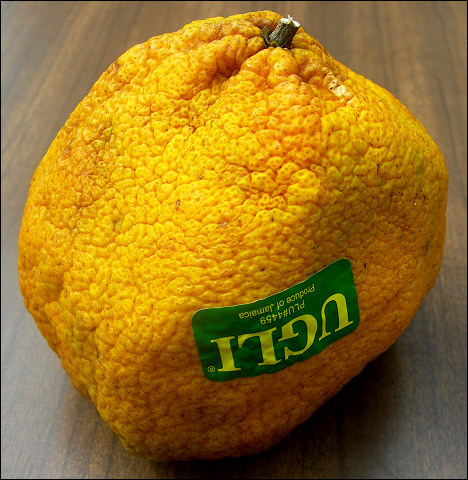 The name is a variation of the word "ugly", which refers to the fruit's unsightly appearance, with rough, wrinkled, greenish-yellow rind, wrapped loosely around the orange pulpy citrus inside. The light-green surface blemishes turn orange when the fruit is at its peak ripeness. A tangelo fruit is usually slightly larger than a grapefruit (but this varies) and has fewer seeds. The flesh is very juicy and tends towards the sweet side of the tangerine rather than the bitter side of its grapefruit lineage, with a fragrant rind. The taste is often described as more sour than an orange and less bitter than a tangerine, however, and is more commonly guessed to be a lemon-tangerine hybrid. The fruit is seasonal from December to April. It is distributed in the United States and Europe between November and April, and is on occasion available from July to September.